If you’re in the market for renters insurance — good for you! It’s a smart, affordable way to protect your college student. Credit Checks. 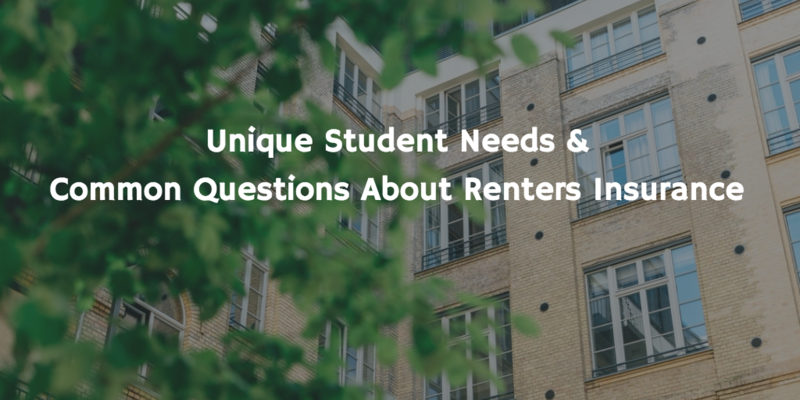 Many renters insurance policies require a credit check against the student’s profile. A low or limited credit score can lead to higher prices. High deductibles. A deductible of $500 or more doesn’t help a student when their $350 bicycle is stolen. Coverage Gotchas. Such as coverage that includes replacement value and not depreciated value. That is not helpful to a student whose backpack is stolen and needs a computer to be replaced at the current retail price. Property Only Coverage. 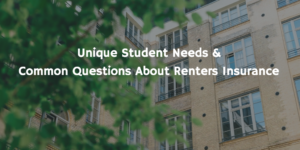 First of all – property insurance is not renters insurance, but sometimes students think they are the same thing. Students and their families benefit from true renters insurance that includes personal liability coverage as well as property coverage. Liability coverage is a part of your renters policy that helps cover the costs due to accidental bodily injury and property damage of others. It also will help cover the cost of lawsuit expenses should something happen in your apartment. Take confidence that GradGuard’s College Renters Insurance has been designed just for college students. You can trust us to be straightforward and offer your college student the protection that is right for their college life. Is all of my personal property covered? Typically, renters insurance policies cover most of your personal property, like clothing, furniture, electronics, etc. There may be limits on things like jewelry and other higher-end items you own. What perils are covered? Most renters insurance policies commonly covers perils like theft, fire and smoke damage, water damage from bursting pipes and overflows, and even offers liability coverage. What is the amount of renters liability insurance? Is it sufficient? Do you need $25,000 or $250,000. A licensed insurance professional can help advise you. What is medical expense coverage? Another facet of the liability coverage on your renters policy is that it helps cover medical expenses for guests injured in your rental unit. Say a guest breaks their leg by slipping on your freshly mopped floor — instead of using their own health insurance, they can submit their medical bills directly to your renters insurance company. Keep in mind, this coverage won’t cover your own medical bills or anyone who lives with you — that’s why you have health insurance. Can I move my renters insurance to another apartment? Nearly all renters insurance policies require the insured to maintain their address. If you move, you must update your address with your insurance company. Will a renters policy cover my roommate? A renters insurance policy does not extend coverage to any of your roommates unless their names are specifically written in the policy. Typically, roommates don’t share renters insurance. Am I covered if my property is stolen when I’m on the go or away from campus? Many people don’t know that one of the great benefits of renters insurance is that it can help cover the cost to replace your belongings that were stolen if you’re traveling. So, if a student backpack was stolen while you were visiting your home in a different state, your renters insurance could help cover the cost to replace them.